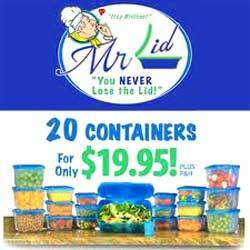 Mr. Lid features a patented design and the lid of the containers is guaranteed to stay put in place. To keep your food fresh simply snap and seal the lid and the lid creates a vacuum seal making the container air and water tight. Even if you drop it the lid won’t come off. Mr. Lid is safe to use in the microwave and freezer. 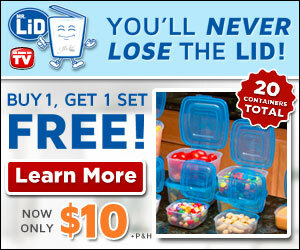 Mr. Lid container can be used to serve or to stack and store. It is ideal to store fruits and vegetables. You can also pack your kids snacks in it or use it to take lunch to the office. It is easy to clean and is dishwasher safe. You can also easily store them empty because one container easily fits into another. Mr. Lid containers come with a lifetime replacement guarantee so if your containers ever lose its seal, cracks or breaks we will replace them free. So stop looking for lids and order Mr. Lid today.